We Brits will gladly embrace any opportunity to eat a bowl of whipped cream and call it dessert. Trifle, Eton mess, posset… they’re all classic British puddings, and they’re all basically 90% cream – but just because we give them a fancy name, it seems entirely appropriate to grab an enormous spoon and dig in. 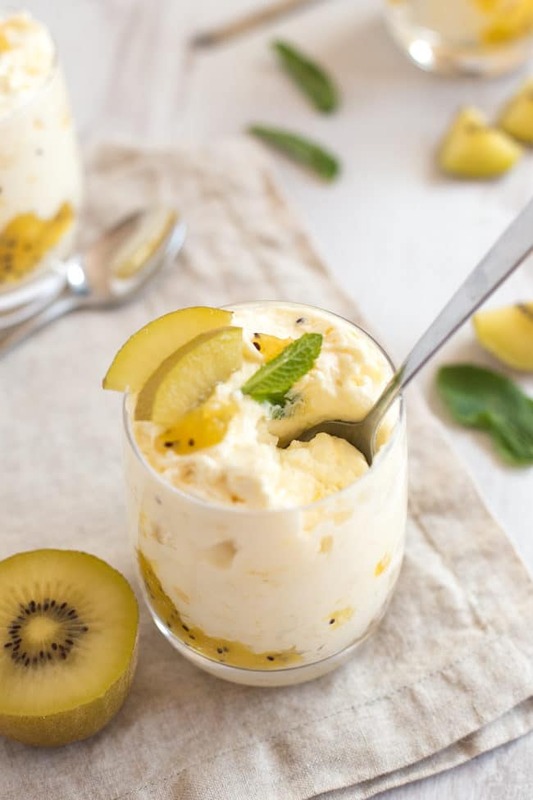 No complaints here, and this kiwi lemon posset is no different. 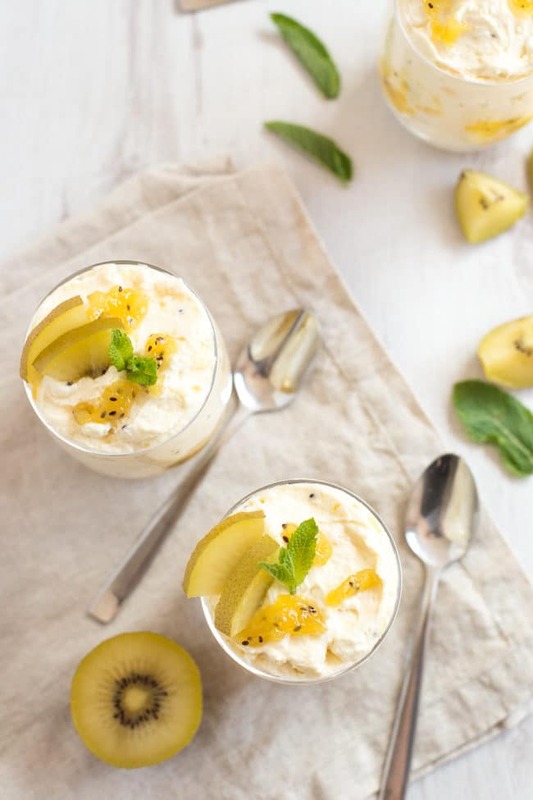 This is a super simple version of a classic posset, made with whipped cream, mascarpone cheese, lemon curd, and an easy homemade kiwi jam. Rather than using the usual green kiwis, I used Zespri SunGold kiwis, which are basically a golden version of kiwi fruit. I find them a bit sweeter than green kiwis, so they’re perfect for helping to balance out the tanginess of the lemon. 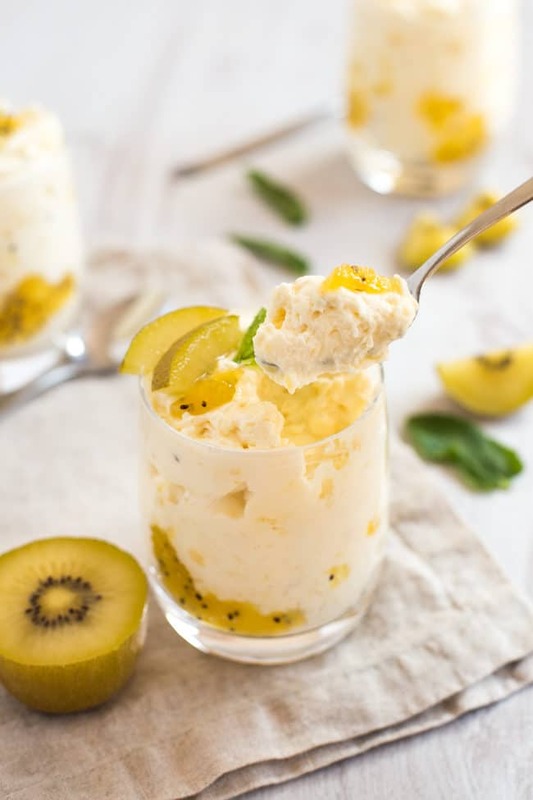 It also means that you don’t need to overdo it with the sugar in this dessert – the SunGold kiwis are beautifully sweet on their own. There’s only actually two spoonfuls of added sugar in the whole batch, which I think is pretty great for a dessert that tastes this good. 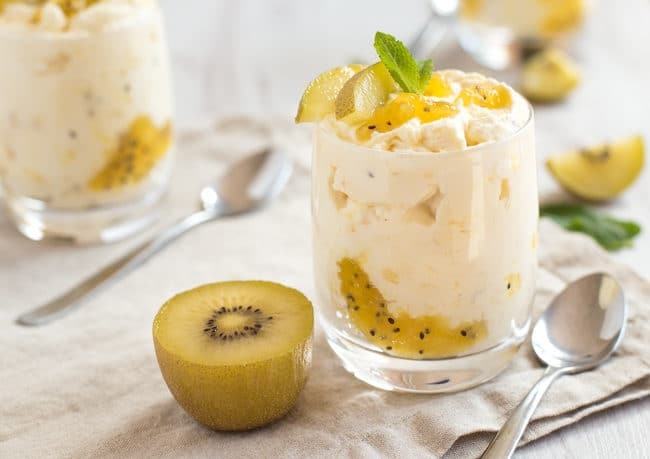 SunGold kiwi fruits are perfectly in season at the moment, so it’s a great time to make this kiwi lemon posset. It’s just the kind of thing I love to make for guests, since it can be made in advance, and seems much more impressive than it actually is – it really couldn’t be easier. Just whip up some cream, and stir in the other ingredients, then pop them in the fridge until you’re ready to serve. I added a little sprig of fresh mint to make them look even fancier, but you can skip that if you prefer. 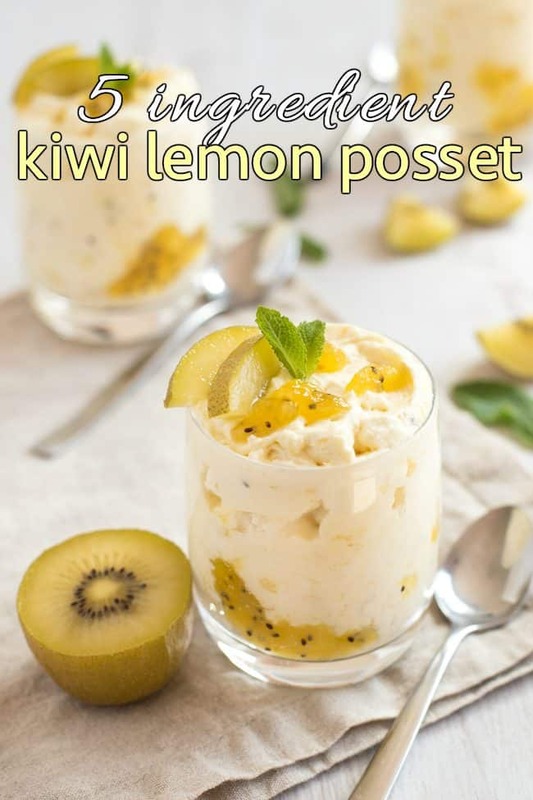 If you’d like to give this kiwi lemon posset a try, Zespri SunGold kiwi fruits are available nationwide from May to December 2017, in all leading supermarkets. Add the chopped kiwi fruit to a small saucepan with a couple of tablespoons of sugar. Cook over a medium heat so that the fruit releases its liquid to create a syrup. Bring to a gentle simmer, and cook for another 10 minutes or so, stirring regularly, until the mixture thickens. Be careful, as the jam will be incredibly hot - don't allow the pan to spit. Set aside to cool completely. Whisk the whipping cream until it forms soft peaks (it's much quicker to do this with an electric mixer!). Add the mascarpone cheese, lemon curd, and most of the cooled kiwi jam (just hold back a tablespoon or so), and mix well to combine. Smear most of the remaining kiwi jam around the inside of 4 small glasses, and add the kiwi lemon posset. Garnish with any remaining jam, and fresh mint if desired. To add an extra twist to your homemade kiwi jam, make it with lime! 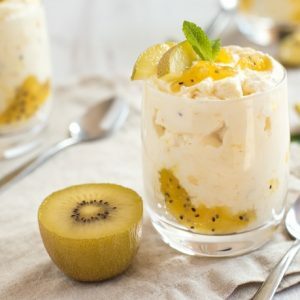 This would be delicious made with SunGold kiwi fruits. Gotta confess, from the get-go part of my motivation to make this would be so I could say “posset” as many times as possible. Ha! Seriously though, this sounds/looks exquisite. 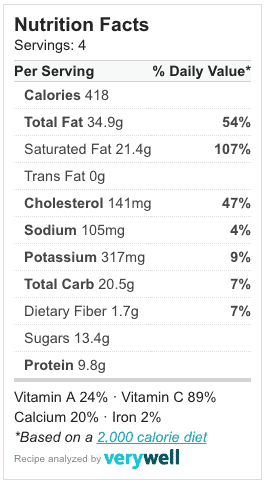 I love the simplicity of the ingredients list and can practically taste the sweet/tart/creamy mixture. Yum. Wow, it looks so delicious!!! You are so talented!!! Perfect for a happy summer:) Thanks for sharing. Refreshing and palatable dessert! I would love to try it, Becca! Now what is mascarpone cheese? I thought that kiwi looked pretty yellow, thinking that there was something wrong with your photography! Haha, it’s just a type of kiwi, didn’t realise there was a golden type of kiwi out there. Great to hear this type of kiwi is sweeter than the green kiwi, would love to give them a try! Haha what are you trying to say about my photography? ;) Yeah they’re really lovely, definitely give them a try if you spot them! How would you adjust it if you couldn’t get a hold of the golden kiwis and just could get normal green ones?